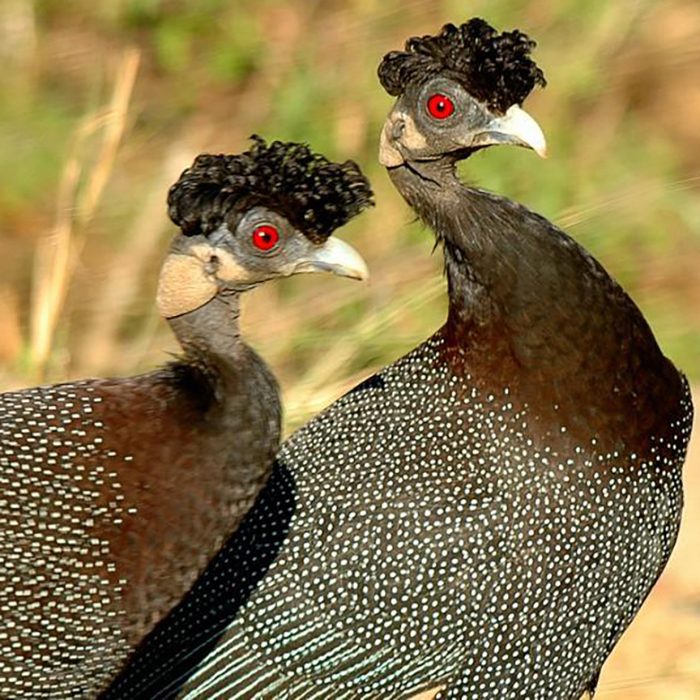 Guinea fowl found in the United States are the domesticated form of the helmeted guinea fowl originating in Africa. They are related to other game birds such as wild turkey, partridges and pheasants. They have plump, roundish bodies with short rounded wings and a short tail. 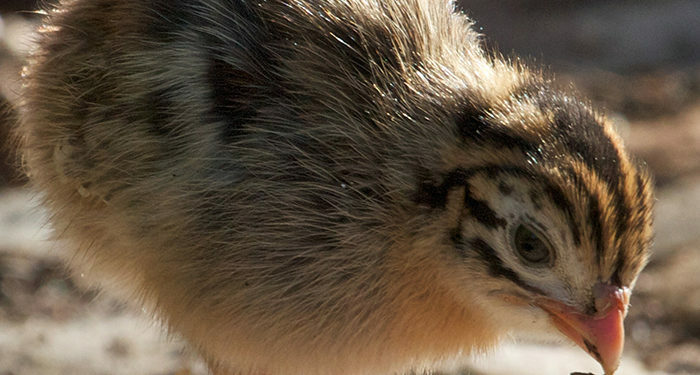 Small, featherless heads and necks help them regulate temperature. They range in length from 16-28” and weigh 1.5-3.5 pounds—when mature—about the size of a large chicken. Domesticated Guinea fowl feather coloration can have various combinations of colors, including yellow, blue, white and purple. The coloration of the skin can be a combination of hues: blue, red and black, giving it somewhat of a clownish appearance. Their beaks are short but curved and very stout. Both males and females may have wattles on each side of their beak and a large backward-curving bony “helmet” on top of their heads making them appear somewhat prehistoric. They do not reach sexual maturity until their second year, making it hard to tell them apart. Males may have larger wattles and a larger helmet. 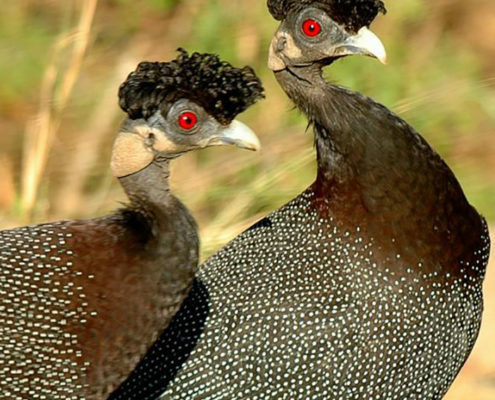 While their African relatives may roost in trees, keepers of domesticated Guinea fowl are advised to train their fowl to return to a coop at night. This primarily is a safeguard against predators and generally keeping your flock from walking away. They do not like being confined and may become stressed without an adequate 2-3 square feet space, per bird. They do not like entering dark places and a low-level light should be used within a coop. In a barn they may be found roosting high in the rafters. 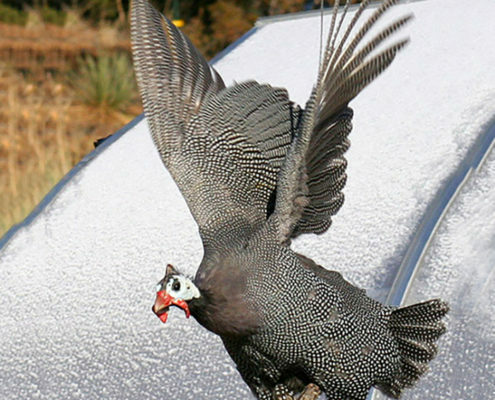 Guinea fowl can walk, run, and fly. 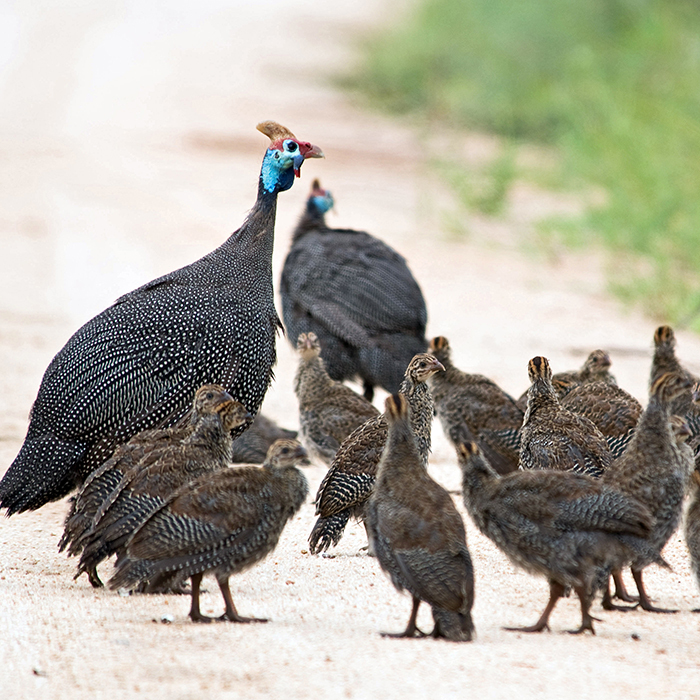 Guinea fowl are highly social within their own kind and stick together—follow the leader style. They are known for being noisy—“announcing” when something alarms them. Many say everything alarms them. Depending upon the circumstance, they may be an asset as “guard birds,” or they may be a nuisance to the neighbors. 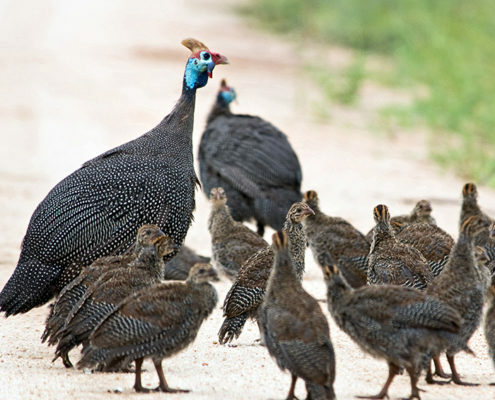 Co-existing with chickens does happen, but the male guinea fowl can exhibit extreme territorial behavior and attempt to drive off any roosters. They can also bully smaller birds with the strict pecking order they enlist, becoming brutal. It is found the males may be less aggressive if they are raised with chicks, or keets, as the babies are called. They are monogamous. Hens are seasonal layers, and will lay daily from early spring (March/April) through to the fall (September/October), depending on the location. 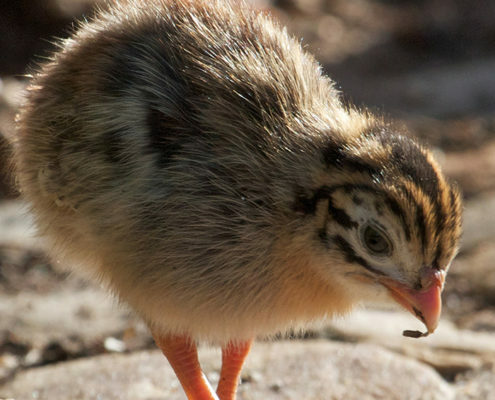 On average a hen will lay 100 eggs per season. A hen is not fussy about where she makes her nest to lay her eggs—in tall grass, in the woods—anywhere she feels is safe from predators. The eggs are smaller than a chicken’s, light brown and speckled and have very hard shells. If you choose to eat them, you will find they are very rich. Guinea hens are known for being “communal layers” in that more than one hen may lay her eggs in the same nest, at the same time. It is not unusual for 50 eggs to be in one nest. The hens are also communal brooders, taking turns sitting on the nest; incubation is generally 26-28 days. Susceptible to moisture and cold, once hatched the keets need to be kept warm and dry, a throwback to their African origin, for a minimum four (4) weeks, at which time they stand a good chance of growing to adulthood. Keets need a high protein feed until five (5) weeks, at which time the protein content should be gradually reduced. 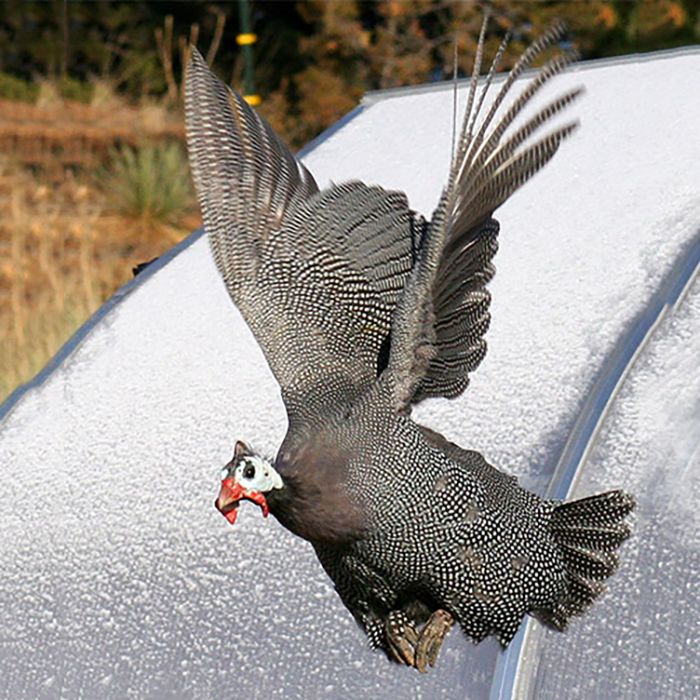 Keets need mashed or crumbled food; pelleted food is not recommended—it is highly toxic to Guinea fowl. Adults are valued for their eating habits: ticks, wasp nests, termites, spiders, worms, rodents and small invertebrates. They are another species which help keep disease-bearing insects in check. Domesticated Guinea fowl can live 10 to 15 years. Guinea fowl are semi-domesticated even though they have been raised in captivity for centuries—because of this they are extremely hearty. If you are a beekeeper, you will need to protect your hives or the Guineas will help themselves to the bees as they emerge from the hive. If attempting to catch a Guinea fowl netting would be most efficient. Do NOT grab them by their legs. They are delicate and break easily. 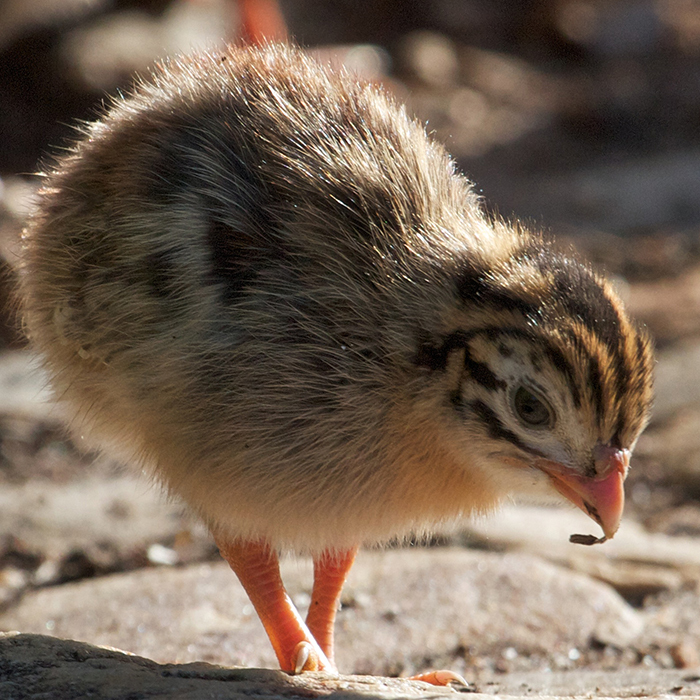 Guineas are fast and trying to catch them in the open is generally unsuccessful. If they can be rounded-up into their coop you stand a better chance. Guineas fly, so that should be taken into account.